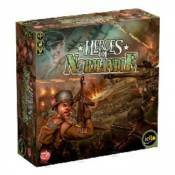 Heroes of Normandie is a new, fast-paced WW2 strategy wargame inspired by Hollywood war movies. This is a tactical scale board-game for 2 players, each commanding their own armies. The Germans on one side, the Americans on the other. Players deploy their units, secretly plan their attacks and try to outwit their enemies by blocking their strategies and surprising them. One thing�s for sure: there's no turning back.